ROOF Board Members tour new unit! ROOF Over Head just purchased its fourth unit and is looking for a new family to join the program. Below are some pictures of some of ROOF's board touring the new unit. NEWBURYPORT — Roof Over Head Collaborative, Inc. (ROOF), a nonprofit organization providing supportive, transitional housing and social services to l...ocal homeless and at-risk families, has two housing openings. “Our board is very pleased to announce that we have received a substantial grant of $60,000 from Franklin Square House Foundation located in Boston,” said Walter Power, co-president of ROOF, in a press release. ROOF is accepting applications for two current housing opportunities. Families with children, who are motivated to improve their financial situation, live in safe, supportive housing and work with counselors, should apply. Families can email info@RoofOverHead.org for an application or visit www.roofoverhead.org for more information. ROOF takes a unique approach to help the nearly 300 local families facing homelessness. The goal is to help financially at-risk families with dependent children who have the ability and motivation to contribute to their housing costs. Once a family is selected, they are required to meet with a social services representative for regularly scheduled budget, employment and educational counseling. All client families’ identities are kept in confidence. ROOF’s program is designed to provide housing for up to two years. Rents increase at appropriate milestone points to help ensure families build the financial management skills and budget stability that will enable them to pay market rate rents by the end of their lease. In addition to signing a lease with ROOF, families sign a Memorandum of Understanding outlining their responsibilities and the expectations of the ROOF program. ROOF was founded in 2009 and since then has housed five families in safe, supportive housing and now owns four properties. The ROOF program houses families in safe, supportive homes for up to two years while the family works to regain their financial independence. At the end of the program, the family, with the help of the social services partner, is moved into permanent housing. To sustain this program, Roof relies on partners, private donors and volunteers who provide funding, advocacy, social services and volunteer hours. ROOF maintains a dedicated board of directors and works with a legion of local volunteers to solve the issue of homelessness in the community. Learn more about ROOF at www.roofoverhead.com. 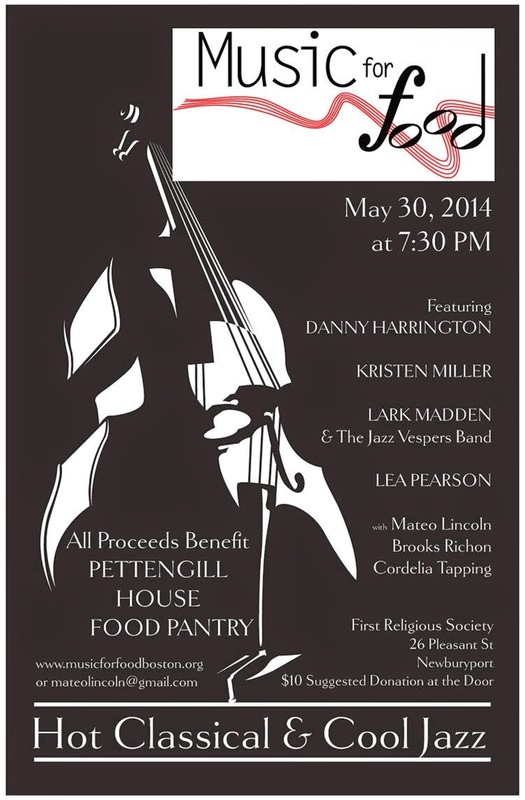 On May 30, 2014, at 7:30 PM, a benefit concert featuring local professional musicians and talented youth musicians from the Preparatory School of New England Conservatory will take place in Newburyport at The First Religious Society, with all proceeds going to Pettengill House in Salisbury. The program will include original music, as well as masterpieces ranging from a Dvorák Piano Trio to well-loved Jazz Standards, played by local legends such as Kristen Miller, Danny Harrington, Lea Pearson, and Lark Madden and the Jazz Vespers Band. Local student and pianist Mateo Lincoln is organizing this event through Music for Food, which is a musician-led initiative to fight hunger in Boston area communities. Music For Food embraces the tenet that music and food are essential for life, as they both enrich us and allow us to grow. The organization strives to empower musicians of all ages to use their artistry to further social justice. The First Religious Society Unitarian Universalist Church is located at 26 Pleasant Street in Newburyport. The concert is open for all ages and there will be a $10 suggested donation at the door. For more information, call 978-465-7765, or email Mateo Lincoln at mateolincoln@gmail.com. To learn more about Music for Food visit www.musicforfoodboston.org. If you would like to receive this list via email in a spreadsheet, please email info@ROOFOverHead.org. Consignment, Thrift and Free Clothing, Household Goods, and other stuff! SALISBURY, Mass. — In an East Coast beach town this time of year, you’re struck by what you feel and by what’s missing. Here on the oceanfront in Salisbury, on Massachusetts’ far North Shore, you feel the cold breeze and the moist air off the ocean. It bites right through your clothes. What’s missing are the throngs of people who’ll pack this place in a couple of months. But right now, most of the restaurants and the tourist shops are closed. Still, the offseason does attract many other people who come here to stay for months — not on vacation, but out of necessity. Many people who are struggling are drawn to this beach town during the winter. Jean — who we met in town at the Pettengill House, a social service agency that covers 10 local communities — has been homeless three times. In order to protect her and her two young children, she’s asked we use her middle name. Jean tells us how she found herself, 27 years old with a 6-year-old son and a 4-year-old daughter, living in a Salisbury hotel, or motel, since January. Unreliable transportation, past evictions and an abusive relationship left her looking for a temporary solution to homelessness. She found it in Salisbury. Jean pays the bills working long hours as a personal care attendant for an elderly couple. Her rent is $251 a week for one room. “Salisbury is a seaside community where we have a lot of transient population,” explains Ann Champagne, a retired Salisbury Police Department detective and a case worker at the Pettengill House. “What I mean by that is winter seasonal rentals — they may be cottages, they may be motels, they may be apartments — are rented only for the season and the people have to be out come April, so they’re rented for the winter,” Champagne says. That transient population pulses in and out of beachfront communities all along the Massachusetts coast during the summer months, when Salisbury’s year-round population of about 8,000 swells to nearly three times that. Officer Leavitt is a nine-year veteran of the Salisbury Police Department. He primarily handles domestic dispute cases; the number of which he says remains relatively consistent year-round, even though the winter population is three times less than the summer population. Leavitt speaks with us in the 1930s-era police station in a windowless, multipurpose room that houses the department refrigerator and the 911 computer system. We’re joined by Det. Sgt. Anthony King. When he says “opportunity,” King is talking about the opportunity for crime. Streets in winter are largely deserted and empty summer houses can be targets for some people who might be criminally-minded. Salisbury Police figures show burglary and breaking and entering charges spiked in the offseason last year — October through March — outpacing charges in the summer, when the population, you’ll remember, nearly triples. Crime is a worry for Jean, living in the motel with her two kids. “I don’t feel safe,” she says. “I know what’s rolling around down there. I sleep with both locks on the door and I sleep closest to the door. The lack of space in that one motel room is also an issue, and it’s taking a toll on her children. Jean’s son began the academic year in Bradford Public Schools, about 30 minutes from Salisbury. That’s where they were living before moving to the motel in Salisbury. Under a federal law that mandates school district support of homeless students, Jean had the right to choose where she wanted her son to finish out the school year. So her son still attends school in Bradford, picked up every morning in a cab paid for by the school district. Embarrassing for the boy and challenging for the towns. The numbers fluctuate, but on average, almost one in six of the roughly 550 children in Salisbury Elementary School is experiencing homelessness. Though the student-teacher ratio in Salisbury is better than the state average, the grade school’s MCAS scores in English, math and science have been below the state average the last three years. “We could have a student the day before MCAS show up, take MCAS and it counts on Salisbury’s report card. And then leave the next week,” explains Jim Montanari, whose been principal of Salisbury Elementary for nine years. Montanari’s office is dominated by a wall of pictures of his own kids and inspirational learning material for his students. He says among kids who live in town year-round, scores are improving. But it’s difficult when you’re teaching children who are there for just part of the year. Meantime, Jean may have to move out of her Beach Road motel in Salisbury. With the winter rental season almost over, her weekly rent is about to rise. If Jean can’t find an affordable apartment — and so far she’s had no success — she and her kids are likely to be homeless again. BOSTON — With homelessness on the rise in Massachusetts, supporting school age children experiencing homelessness is also a growing challenge. In the 2011-2012 academic year, public schools across the state identified and served more than 15,000 homeless students. Alan Ingram, deputy commissioner of the state Department of Elementary and Secondary Education, joined WBUR’s Morning Edition and says the main priority is making sure these kids can get to school. To hear the full report, please click here. To receive this as an Excel or Word file for printing or editing, please email info@ROOFOverHead.org. Further, if you have information to update this please, please email us that as well. NEWBURYPORT — The number of homeless people living in Newburyport and four surrounding communities declined from the previous year, but according to the Greater Newburyport YWCA, which conducted the survey last week, those numbers could be skewed. The survey, which was conducted by YWCA volunteers and board members, showed that there are 369 homeless people living in Newburyport, Amesbury, Rowley, Salisbury and Newbury. That’s down from 405 the year before, the first time the YWCA conducted such a survey. But according to Greater Newburyport YWCA executive director John Feehan, there’s reason to believe the number of homeless is greater. As part of their count, volunteers call area hotels, where many homeless people live. This year, one hotel that housed 25 homeless people according to last year’s survey declined to answer this time around, according to Feehan. “This year they didn’t cooperate with us and give us numbers, so we think the numbers are actually very close to what they were last year. My suspicion is if you take that number out of the equation, then that’s the difference,” Feehan said. The definition of homelessness, the lack of a permanent dwelling meant for human habitation, may come as a surprise to some, as it’s more than just a person living out in the elements. It includes anyone living in hotels, those couch surfing with friends and even multiple families living in an apartment legally intended for one family because the additional families are at risk of eviction if discovered. In conducting the survey, organizers are hoping to accomplish multiple goals: raise awareness of the plight of the homeless and make the case for additional resources to help those in need. The survey includes children enrolled in school districts, who make up the majority of those considered homeless. When taken out of the final tally, the survey showed that there were 44 homeless in Amesbury, 20 in Newburyport and 19 in Salisbury for a total of 83. Last year, the survey identified 76 individuals, including five children, in Newburyport, Amesbury, Salisbury, Newbury and Rowley who were considered homeless. Of those, 45 were found in Salisbury, 17 in Amesbury and 12 in Newburyport. Volunteers also called veterans services providers in multiple communities to determine how many of the homeless served in the country’s armed forces. Last year a count of homeless veterans identified five in Amesbury, two in Newburyport and one in Newbury. This year, a check of veterans services offices showed that there were no veterans identified as homeless. Feehan said those encouraging numbers lend more evidence that the state’s recent push to find housing for veterans has been a success. “What that tells me is the push for veterans has made a big impact. What the numbers also tell me is that there is still a huge need and the numbers from the school are still staggering,” Feehan said. NEWBURYPORT — Only a month in, winter has featured day after day of relentless cold and numerous snowstorms. It has made even the most hearty New Englanders grumble and grouse about the return of spring and how they are looking forward to getting out of the cold and back to their warm homes. But for the region’s homeless, the options are far less appealing. For them, the best that awaits them may be a canvas tent pitched in the middle of an overgrown field or, if they’re lucky, a night in an area motel room. Despite Newburyport’s status as an affluent community, there is not a single shelter bed within the city limits or the entire area. The closest shelter, according to YWCA Greater Newburyport executive director John Feehan, is Haverhill. Yesterday, volunteers assembled by the Newburyport YWCA conducted a comprehensive survey of the area’s homeless population. In addition to calling area hotels and speaking to regional aid providers and school districts, volunteers visited six areas in Newburyport and Newbury known to the Salvation Army and local police as places where the homeless might be living. The teams, which included YWCA board members and Mayor Donna Holaday, joined Feehan in the search. Feeney said this year’s results, which were not complete as of last night, could benefit area agencies that provide assistance to struggling families and also act as a catalyst for additional housing for families or displaced teens. Last September, the Greater Newburyport YWCA opened its recently renovated 10-unit affordable housing apartment complex on the corner of Pleasant and Market streets. The units, which are all filled, are occupied by the disabled and the homeless. Despite the success of the apartment complex, the need for more is real. Surveys such as the one conducted yesterday are vital in helping the cause of providing more housing, according to Feehan. As part of their count yesterday, volunteers called area hotels and asked owners or managers for all the information they would provide. Some managers were cooperative in giving volunteers exact numbers; others, including one in Salisbury, said there were no homeless people living there, the explanation being that some of the guests are spouses in the middle of a divorce. Volunteers also called veterans services providers in multiple communities to determine how many of the homeless served in the country’s armed forces. Last year a count of homeless veterans identified five in Amesbury and two in Newburyport. This year, a check of veterans services offices showed that there were no veterans identified as homeless. Around 4:15 p.m. yesterday, Lauren Petty of Newburyport and Jill Brien of Groveland drove down Storey Avenue to their assigned location, one of six identified as where the homeless might be staying. Petty said last year’s survey really opened her eyes to how great the problem of homelessness was in communities that seemed well off. “The results were shocking,” Petty said. Once at their destination, Petty and Brien began peering through dense brush hoping to quickly spot the location. A few minutes later the two began walking down a slight hill, pushing away branches and balancing on iced-over snow. It didn’t take Petty and Brien long to find what they had been looking for: the remains of a blue tent strapped to a tree. Scattered around the tree were rusted cans, a stuffed puppy doll, a yellow pillow, a beer can and a frozen bottle of peanut butter. The two ladies quickly came to the conclusion that whoever was staying there had abandoned the camp and moved elsewhere. After completing their survey, Petty and Brien drove back to the YWCA and began comparing information with other volunteers who had returned. One team found an active encampment in another area of the city that included a four-person tent, a smaller tent with camping gear around it and a bicycle. One of the three volunteers tapped on the tent to see if it was occupied. But as it turned out, no one was home. Shop Amazon through this link to benefit ROOF! When you shop Amazon.com, go through this link - a portion of your purchase will be donated to ROOF! Same shopping, same selection, same prices, same process - just a bit of your funds come back to invest in ROOF! WALTHAM, Mass.—Since mid-October, Jennifer White has lived in a motel room in this Boston suburb with her four children, one of about 110 homeless families who have ended up in the Home Suites Inn after turning to the state for emergency shelter. Ms. White, a 36-year-old who said she is separated from her husband, shares two beds with her children at the privately run motel, although her 8-year-old prefers to sleep on the floor. The biggest challenge is at mealtime. "It's hard to get a balanced meal just being able to cook in a microwave," Ms. White said. Few people believe motels are ideal for long-term living. But a year after Massachusetts set out to stop sheltering homeless families in motels, the population has surged. State data in late January showed 2,081 families in several dozen motels, near an all-time peak and up about 23% from the start of 2013. The state relies on motels when traditional shelters become overcrowded. The stubborn problem reflects lingering effects of the recession, high housing costs and the state's unique safety net. A three-decade-old law requires Massachusetts to provide emergency shelter for all homeless families who meet certain income and other requirements—the only state to have such a comprehensive system. The problem is particularly acute in expensive regions such as Boston, where rentals are at a premium. "We certainly have faced additional challenges," said Aaron Gornstein, Massachusetts' undersecretary for housing and community development. The state—which wants families out of motels by the middle of this year—had some success early last year driving down the numbers. But a jump in homelessness during the summer and fall sent them back up, Mr. Gornstein said. Communities nationwide often use hotels and motels as intermittent backup shelter, said Nan Roman, president and chief executive at the National Alliance to End Homelessness. New York City, which is under court order to provide shelter and is grappling with record-high numbers of homeless people, uses hotels and apartments for overflow. Hennepin County, Minn., uses a Minneapolis hotel to support its comprehensive shelter goals, and Montgomery County, Md., often uses motels, representatives said. But Ms. Roman said the kind of widespread, consistent reliance seen in Massachusetts is unusual. When you get into that mode, it's hard to get out of it," she said. Putting people in emergency shelters cost Massachusetts more than $135 million in the past two fiscal years, according to state data, including about $46 million each year for motels, which cost an average of $82 a night per family. Families typically stay six to seven months. The cost of using motels, however, isn't the central problem; regular shelters cost more per night. Rather, say both the state and advocates for the homeless, motels more than traditional shelters can isolate people in suburbs with little public transit, less access to services and in rooms that often lack kitchen access. And families sometimes wind up far from home—Ms. White and her family moved from central Massachusetts, nearly 50 miles away. The program also can strain communities. Police in Waltham and the Boston suburb of Danvers, which have five shelter-motels combined, said placing families there has increased calls to those locations, with issues ranging from noise complaints to assaults and theft. These facilities have taken on the profile of high-density apartment complexes, police noted. "It's almost like a neighborhood up there now," Waltham Police Detective Sgt. Joe Guigno said. The Home Suites Inn in Waltham started taking in families at the state's request in 2009, when the recession was in full swing and state money for sheltering families seemed like the best path to avoid shutting down, its management said. The motel recently had just one paying guest who wasn't placed there by the state. Homeless advocates—some of whom criticize Massachusetts for tightening shelter eligibility rules in 2012 and say it should focus more on long-term subsidies—cited many factors behind the recent surge in families seeking shelter, including cuts in federal subsidies and a lack of jobs for low-wage earners. Also, Boston is the third-most expensive metro area for renters in the U.S. after New York and San Francisco, according to real estate research firm Reis Inc. Boston-area rents averaged about $1,800 in the fourth quarter last year, up nearly 10% over three years, and $725 above the U.S. average, Reis said. Highlighting the pressure of high rents and static incomes, the city of Boston released data Friday that counted 1,234 homeless families on a recent night, up 5.8% from a year earlier. The city counted more than 2,000 homeless children. Ms. White has considered moving near family in New Hampshire or Florida, where rent might come cheaper, but she said she has stronger ties in Spencer, Mass., and is eager to return there. It was hardest for her eldest, a 14-year-old, to switch from his Spencer school. She said the motel is hospitable and the staff responsive, but the distance from home has made searching for work and housing tough. Massachusetts officials said they are working on multiple fronts to stop relying on motels, including a program that offers as much as $4,000 to help families keep homes or move to new ones. The state in the past 18 months also has provided more than 2,000 new vouchers to help cover rental costs, although advocates are pushing for many more. Gov. Deval Patrick's new budget proposal released in January calls for as many as 1,000 new shelter rooms, in addition to 650 new rooms funded by the current budget.